(Alameda, CA) – The Full Pint is celebrating their 11th Anniversary with an 11 stop collaboration tour. 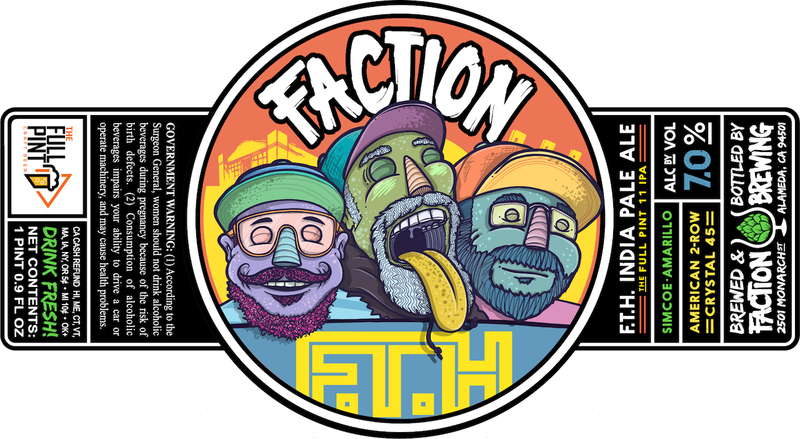 Our fourth stop is with our great friends at Faction Brewing on September 1st for the release of F.T.H. IPA. Join Danny, Jonny and Moises from The Full Pint as we release bottles of F.T.H. IPA. The queso kings from Grilled Cheese Guy, and there will be some 11th Anniversary Commemorative T-shirts for sale. The Full Pint will be at Faction Brewing to hang out when the tasting room opens at noon on Saturday, come say hi! Bottles and cases of F.T.H IPA will be on sale. This is a limited edition beer and might be the only time this is brewed and bottled. F.T.H. IPA is a clear, west coast-style IPA with Simcoe and Amarillo hops, clocking in at 7% abv. The 20-barrel brew house has expanded quite a bit since opening- producing 4,500 barrels in 2015 and 6,500 in 2016. Likewise, the tasting room has expanded from a 6-tap kegerator and a few seats to a 20-tap direct draw system, 30 ft. redwood bar and ample seating indoors and on the 4,000 sq. ft. deck. Children and dogs are always welcome and there is plenty of room for them to play. While inside, you can see the brew deck, equipment and brewers hard at work alongside beautiful murals painted by local artists. To learn more, please visit http://factionbrewing.com.